Back to the regularly scheduled programming, I was thinking earlier about all the neat things I’ve recently received in the mail and how I fail to mention them miserably. I lurve getting mail, you wouldn’t believe the giddy mood it puts me in, you can ask my husband, he’ll swear to it, in fact, he thinks I’m a bit of a dingbat in that regard. 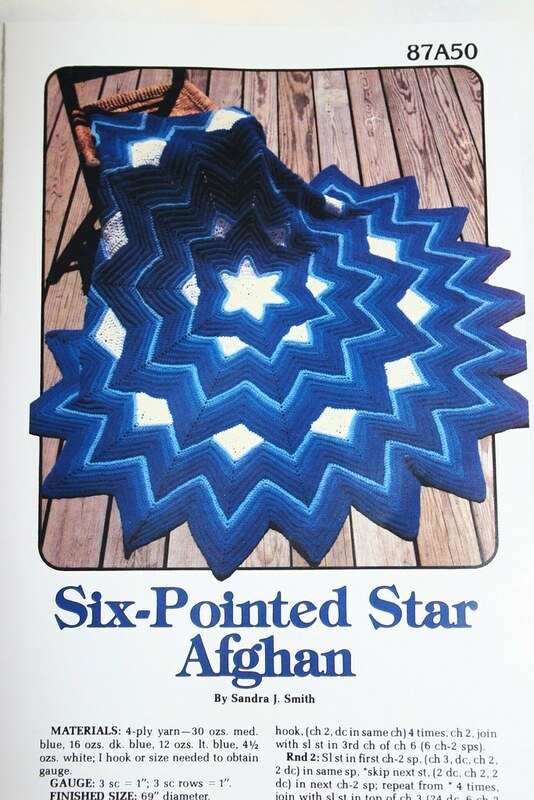 But anyway, I ordered a ton of patterns a couple of weeks ago when I was riding high with a funded paypal account and before both of our cars decided to flake out on us. I hadn’t photographed them until tonight so I can share what my lovely mail carrier brought me! 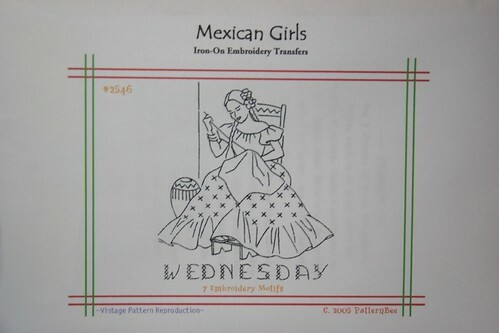 I bought some reprints from PatternBee since I wasn’t going to wait around to find the actual transfers- the embroidery bug bit me and I wanted Mexican ones now! 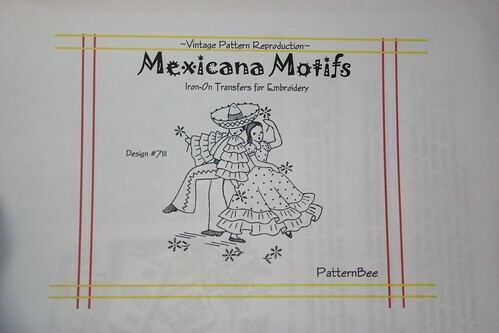 I may get around to collecting the vintage patterns, but for now I’m going to try these out. 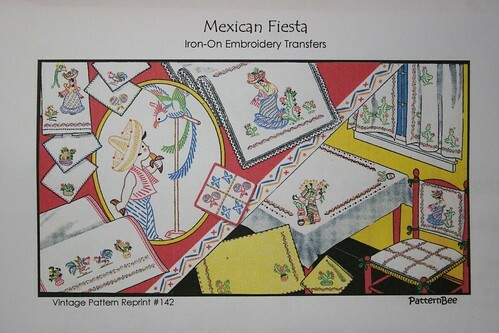 The one above is actually Vogart 142- 28 Fiesta Motifs For Colorful Touches of Mexican Gaiety. The little guy eating a banana with the bird is my favorite of all of the transfers in this set, it’s just so cute, and I love his little panza! 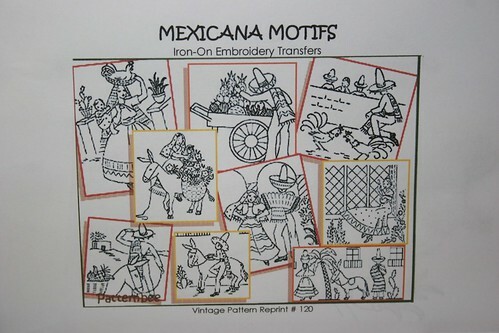 This one is really Superior Transfer Pattern Mexicana- 32 Motifs for Household Linens- Design No. 120. Since I’m a babywearing mama in real life, I think I’m going to start out with the mama wearing the baby on her back and the chicken on her head, and then the woman in the window strumming away is my next favorite. This one is really Walker’s No. 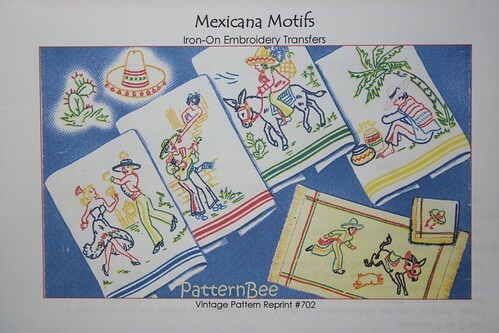 702 Gay Mexican Motifs for Kitchen and Tea Towels, the style is a bit different than the others, but cute nonetheless, I’m always up for dancing women even though when I folklorico danced I don’t remember any of the dresses looking like her’s! Sadly, I don’t know this one’s real name yet, but the hunt is on, I’m itching to get started on some of the designs, but the thing is- I don’t know what to embroider on, I’m thinking on this one, and it’s keeping me from starting anything, I hate when that happens. I don’t know this one either, anyone wanna help a girl out? I probably should take a lesson in housekeeping from her! Can’t wait to use these too, I love the Kurt Halsey birds, over at Craftster you should see how creatively and beautifully some people have used his designs and I can’t ever not get Mexican ones! Last but not least! 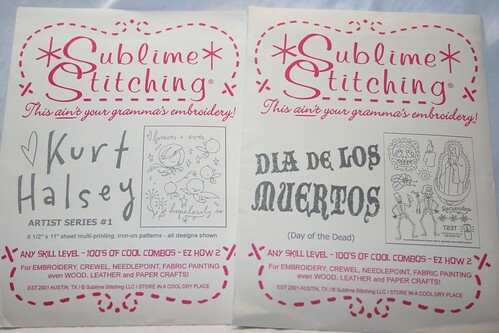 I really love what’s happening over at Sublime Stitching, Jenny Hart is amazing! 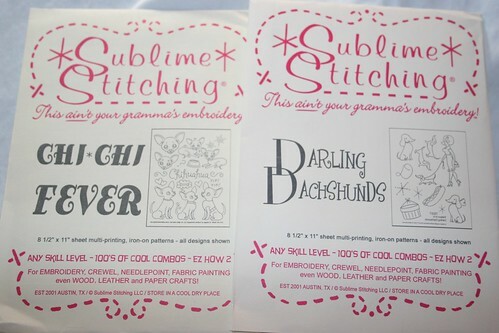 The Chihuahua’s are for my sisters, I’m not that big a fan, but they both have one, so I’m thinking they’ll be getting some Christmas embroidery. I love Dachshunds! We grew up with them and my mom and dad still have one, she was the sweetest and smartest and now oldest dog we’d ever had, she’s actually about 6 months older than my youngest sister, so she’s 19 years old already. When our kidlets are older that’s the first dog we’re getting, whether the hubby thinks they’re girl dogs or not! Congrats on the win! I have been eying it too, lol! Can’t wait to see your’s!